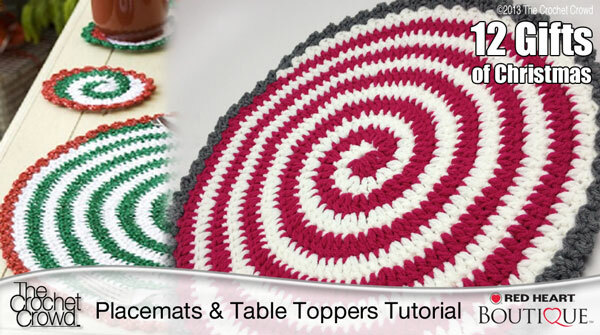 Enjoy fun Candy Swirl Placemats and Centre Pieces design for your holiday decor. I’ve been wanting to do this pattern for a very long time but have always been intimidated by the swirl in the photo. Once I sat down and realized how easy it was, I had egg on my face as I have been scared of something that was so incredibly easy! There is an error in crochet along with the dimensions. Using 2 strands like I did in the tutorial, the finished size following along will end up to be 22.5″ Diameter not 18.5″. You can use single strand yarn if you prefer. For the double strand, I changed the 2nd half of Round 5 from doing 10 DC in a row with 2 DC in the next to only doing 1 DC into each stitch around. Get the Free Pattern and Video Tutorial. This entry was posted in Christmas, General Holidays, Tutorial Videos and tagged Crochet, crochet crowd, Dishes, Free Crochet Pattern, Kitchen, Mikey, Pattern, Video Tutorial. Bookmark the permalink. Already made the placemats and coasters in sets for 4 for gift a couple years ago. Then made a set of 6 for myself. This is really an easy pattern to follow and fun to make.